“Can I first of all thank you for help and knowledge which you imparted to us over those three days, I can safely say that had you not been there, we would not have seen and done a tenth of the things you were able to show us and the places we visited. It was truly an eye opener and I, my son and my brother extend our grateful thanks. You have an encyclopaedic knowledge and love of the area and it was tremendous to be able to tap into that and really learn something about a grandfather who we never got to know. In search of a missing Great-Grandfather. Private Irvine Corrigan. 13th Royal Scots. Monchy le Preux, 23 April 1917. 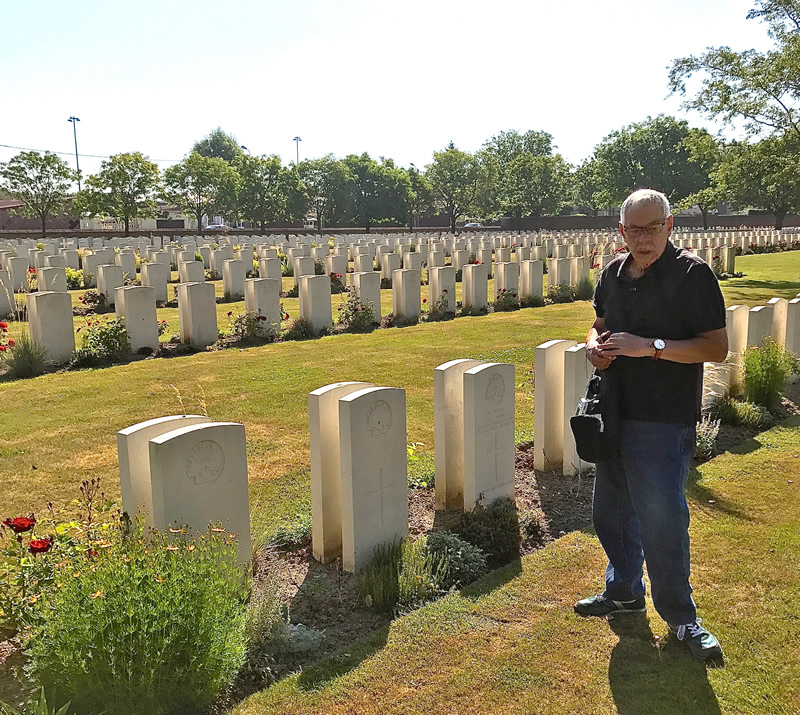 “Jon Nicholls took me around the battlefields of Arras for a day. I wanted specifically to walk in the steps of my great grandfather who served in the Royal Scots. I had a fantastic day thanks to Jon. He is deeply knowledgeable, genuinely passionate about his subject, totally reliable, and very enjoyable to spend time with. Finding Great Uncle, Private Orville Grant Shuman. 116th Btn Candian Infantry Killed in action 29 September 1918. Crest Cemetery Nr Cambrai. In search of Great-Uncle, 2nd Lt Bruce Hills NICHOLSON. 4th Royal Fusiliers. Killed in action 3rd May 1917 at Monchy le Preux. Arras. An Australian Pilgrim visits lost Uncle..
Alfred Ernest LAURENT. Private 39th Australian Infantry Battalion. Killed in Action 9 December 1916. Cite Bonjean Military Cemetery Armentieres. Retracing Great Grandfather Charles Haywood, 9th North Staffs killed in action 27 May 1917. Feuchy Chapel Cemetery ARRAS. “What I wanted to do was probably a bit unusual. I wanted to find all the places my Great Grandfather had stayed during the last month of his life, on the Western Front. After a lot of research, I thought it was almost impossible to do. But then I made contact with Jon Nicholls. He kindly agreed to help my search and we planned for 3 days touring the areas highlighted in the War diary entries. When we started, it became clear that Jon’s extensive knowledge if the area and the battles not only helped us find the places, but brought the whole experience to life. What we managed to discover 100 years on, was much more than I could have hoped for. I honestly couldn’t have wished for a better guide, companion and friend for those few days and can only give the highest recommendation to anyone else wishing to do the same. 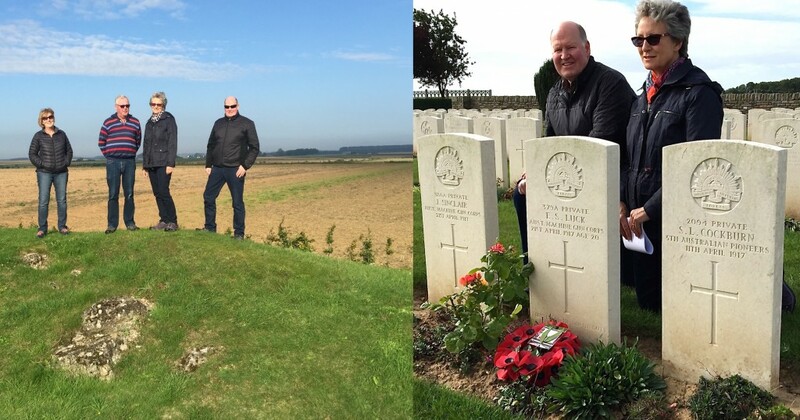 With over 30 years experience of visiting the battlefields, Jon created memories that I will never forget. The travel, hotel and food were also very well chosen and of a high standard. To visit Great Uncle James B Jarvie 7th Argyll and Sutherland Highlanders. Killed in action 18th April 1917. Buried Level Crossing Cemetery, Fampoux. Nr Arras. The Search for Grandad, William Levey. 17th Middlesex captured Oppy Wood 28 April 1917 and to his grave at Denain. A Centenary Pilgrimage to visit Grandad, Willie King Archibold 12th Royal Scots killed in action 12 April 1917. St Catherine’s Cemetery. ARRAS. 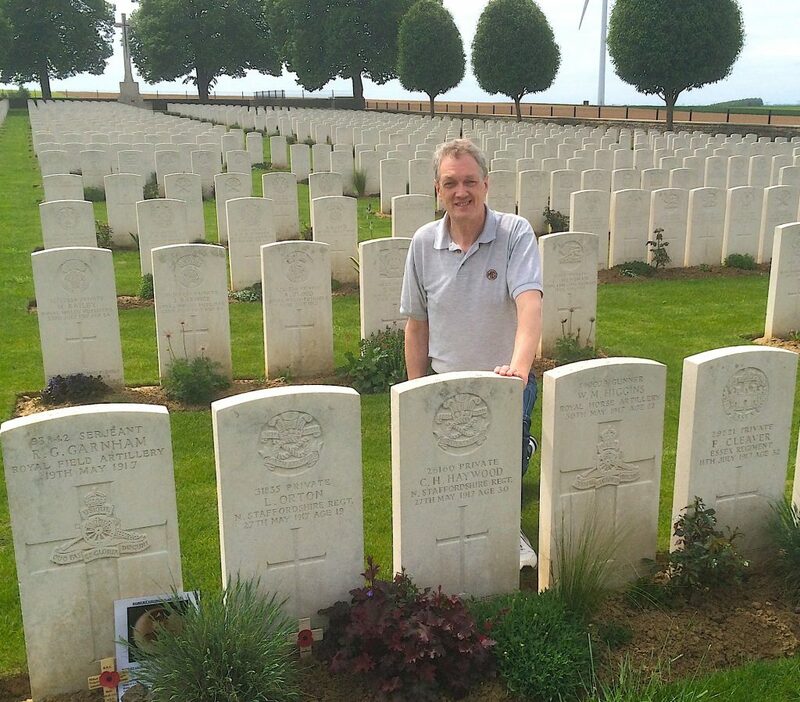 “I am writing this as a heartfelt thank you to Jon for providing for my small family group of five, a wonderful bespoke battlefield experience. Few could claim anything approaching the depth of knowledge which Jon has at his command. All of this done with deep understanding of the human tragedy involved in the various battles of Arras and surrounding area. Killed in action at Bullecourt. 4 May 1917. For a knowledgable and genial guide to the WW I battlefields you will not go wrong with Jon Nicholls. He knows the terrain, the history, the locals and the best places to eat and drink! We were all impressed by his research in pin-pointing the probable resting place of poor Reg at or near, The Crucifix, Bullecourt. 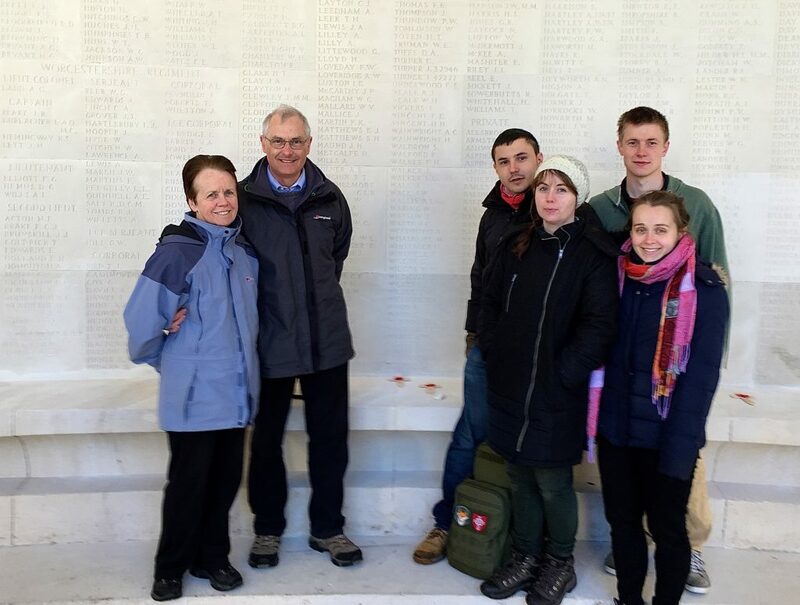 Jon, Thank you again for our 3 days with you as you showed us around the Arras battlefields and the Australian battlefields of the Somme. 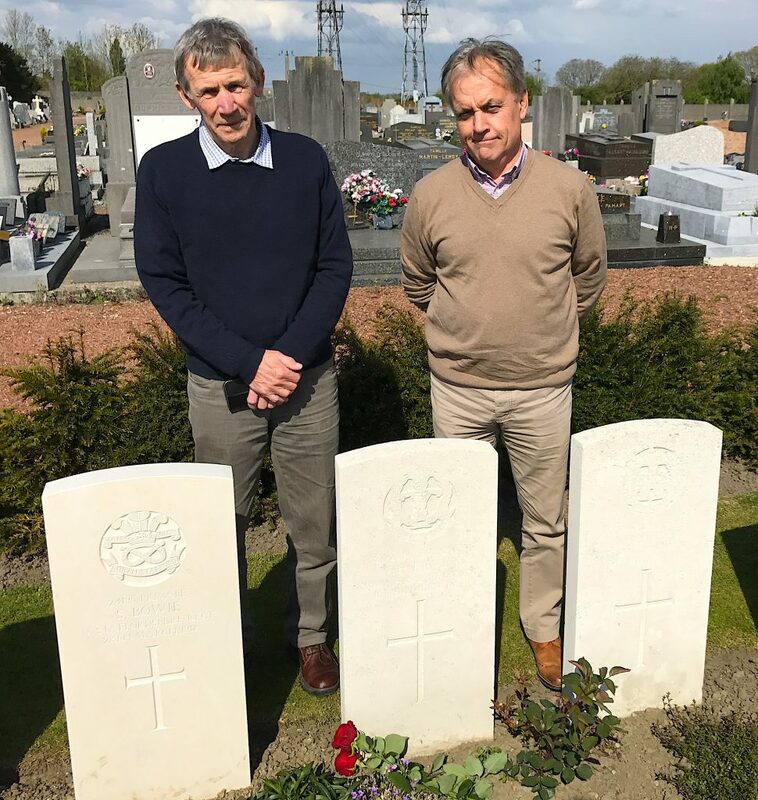 Your knowledge and research made it a very personal experience as we traced where our Scottish ancestor had fought and died in the Arras offensive in May 1917. 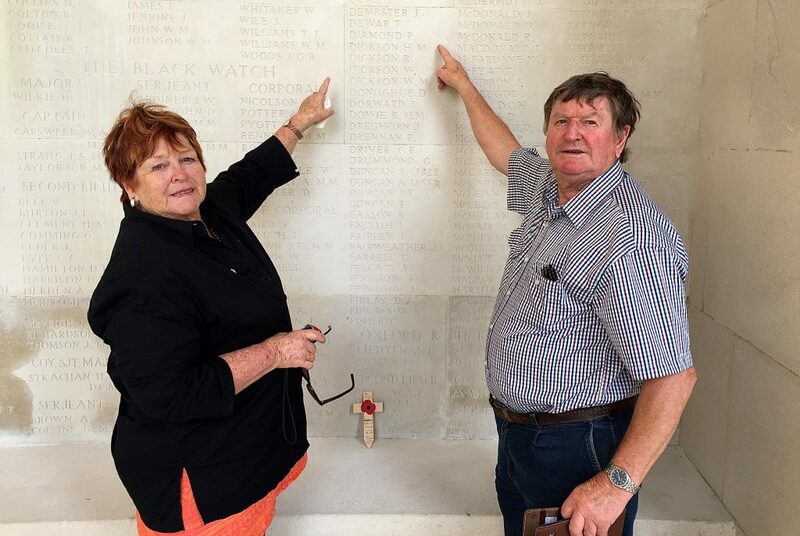 The day trip to see Australian National Memorial at Villers–Bretonneux and the Australian battlefields around Pozières was very special. 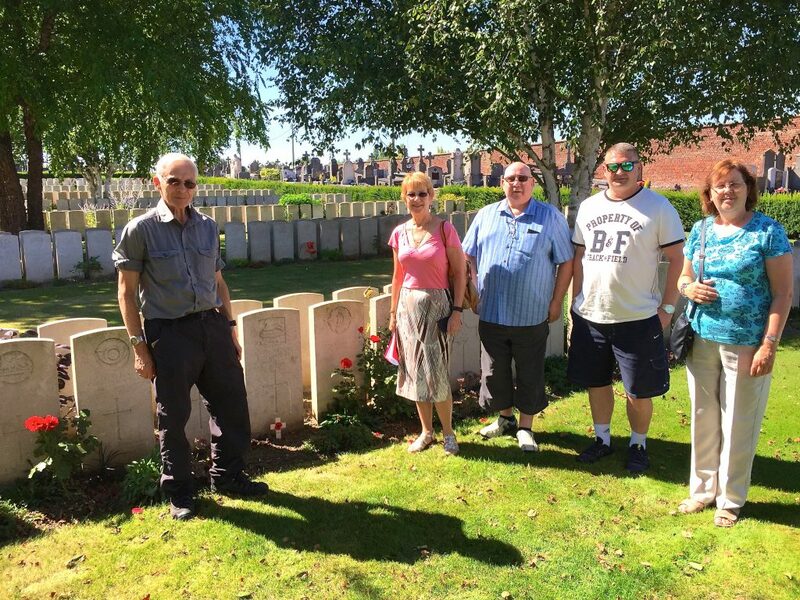 We thoroughly enjoyed your company and the town of Arras was a great place to stay. Myself and 4 friends spent 6 wonderful days touring the Arras, Somme and Ypres battlefields under Jon’s superb guidance. Jon’s expertise and knowledge was outstanding, often giving information relating to individual stories at each location – all from memory and in quite extraordinary detail, delivered with conviction, compassion and humour. I personally very much appreciated Jon’s invaluable help and assistance arranging for me to participate in and lay a wreath at a memorial service at Thiepval, commemorating the 100th Anniversary of the Somme in which my Great Uncle Thomas Brady, 5th Battalion Cameron Highlanders was KIA on 15th July 1916 and whose name is one of the 72,244 “Missing of the Somme” who have no known grave. Jon was an excellent Guide and Host, and most enjoyable company each evening over a meal and a beer or two and without a doubt, Jon made it an experience we shall never forget and would hope to repeat again. I cannot recommend him high enough. 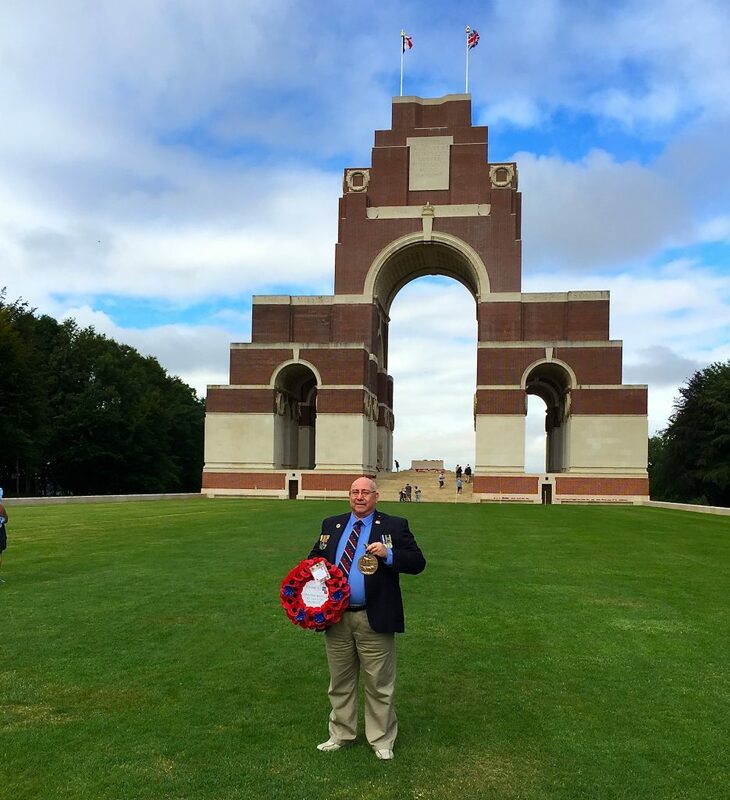 “Our party spent 6 days touring the Somme, Arras and Ypres battlefields under Jon’s guidance. His knowledge of all the battlefields is unsurpassed and as importantly his explanations are interesting and comprehensive with many relating to individual soldiers and characters. 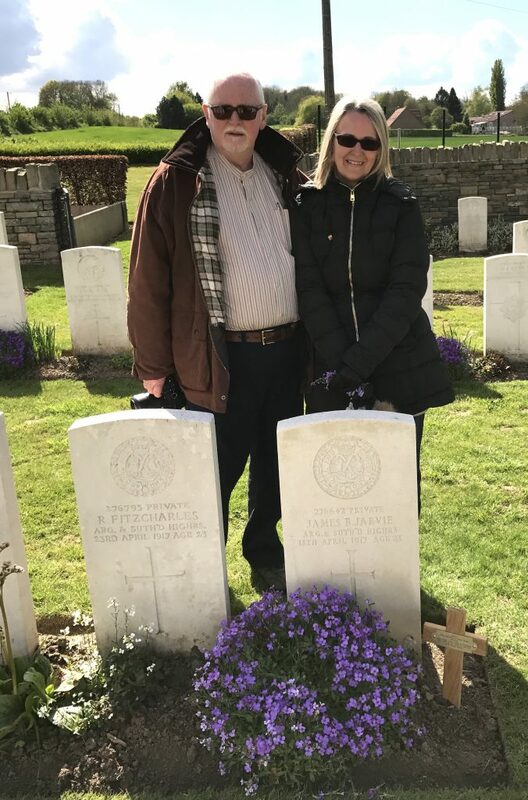 He took us to the sites where our forefathers had fought and died, always an emotive experience seeing the very fields where they fought and afterwards their grave or memorial. Jon is a very sociable and personable character, his knowledge of the best cafes and restaurants removed the gamble of where to eat and his company whiled away the hours in interesting, and often humorous, stories and conversations. Looking for Grandad. Patrick Diamond. The Black Watch. “What a mind blowing experience of the Battle of Arras. 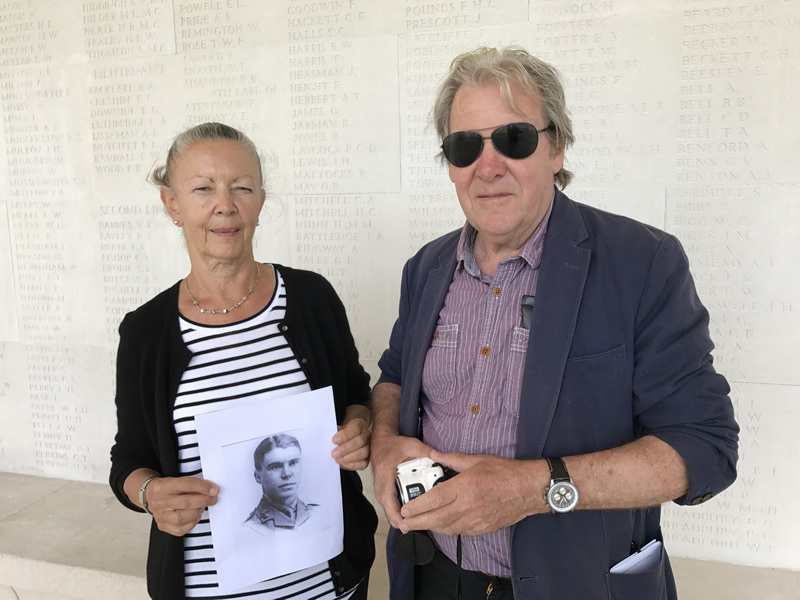 I contacted you last year to ask if it was possible to be given a personal tour of where my grandfather – who served in the Black Watch at Arras and consequently lost his life. 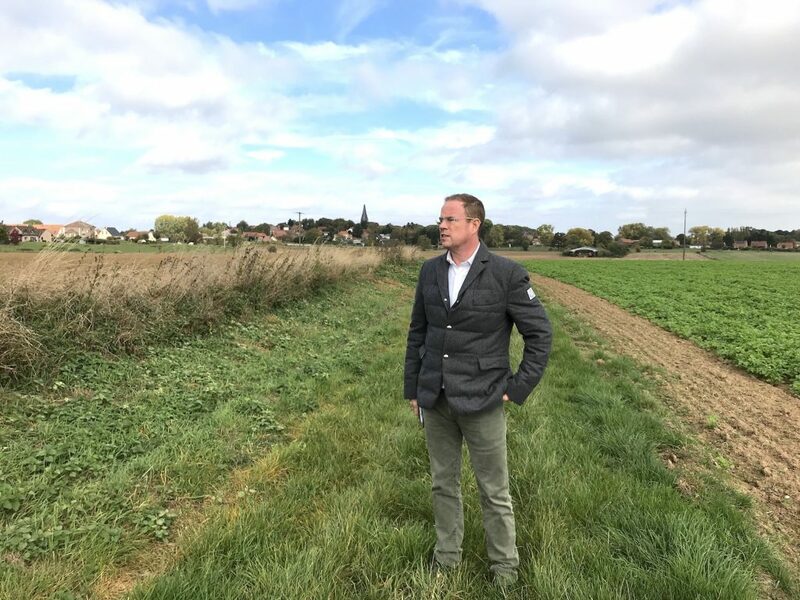 To actually stand where the trench was and look over the field where he actually lost his life, bought home to me what a terrifying time it would have been for all who took part in this disastrous offensive. 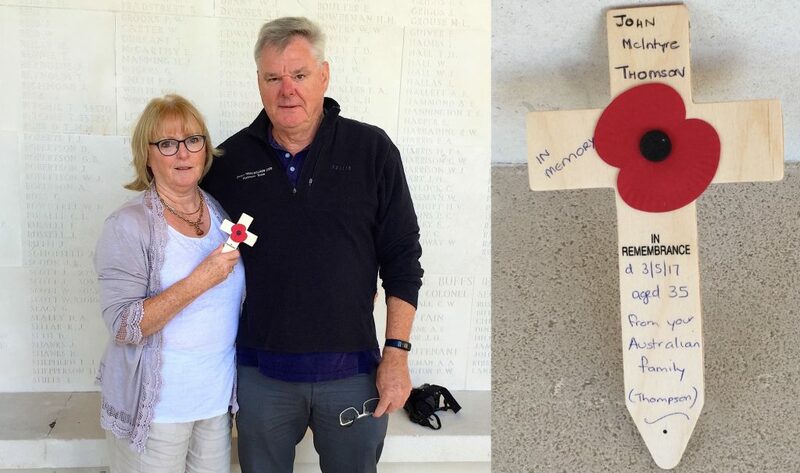 The highlight of the day was to place a cross (which you kindly gave me) beneath his name at the memorial at Arras. The knowledge you passed on to me of the terrible battle and massive loss of life, makes me want this to never happen again. 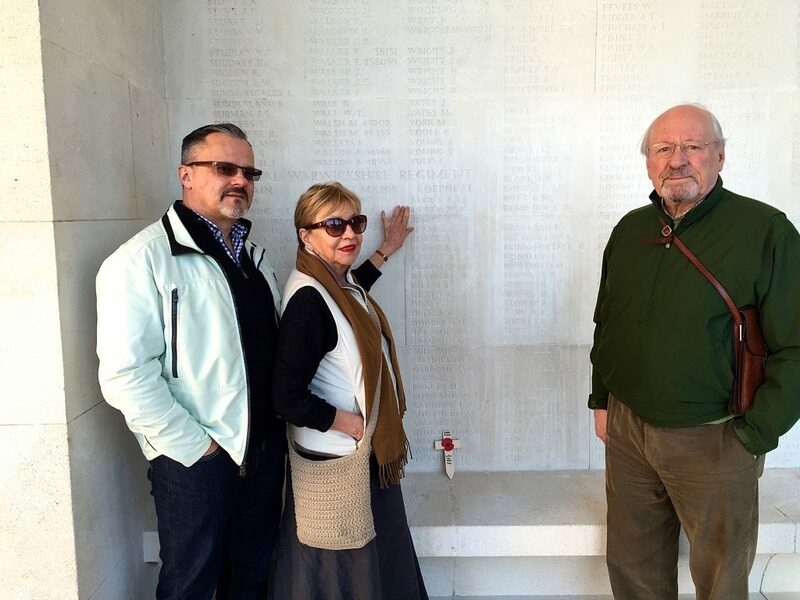 My family cannot thank you enough for your affordable full day tour to Arras. I have just finished a four day, personal tour of the WWI battlefields with Jon. It was an overwhelming experience. He took me to visit four Great Uncles that served in the Australian Army, in cemeteries in Belgium and France. Jon’s knowledge of these areas is encyclopaedic. He was respectful in the solemn moments and knew where to find good coffee afterwards. This is essential! I was collected in London and chauffeured around France and Belgium in an immaculately maintained vehicle. He is an excellent guide and I am very, very glad I found him. A life changing experience for me. 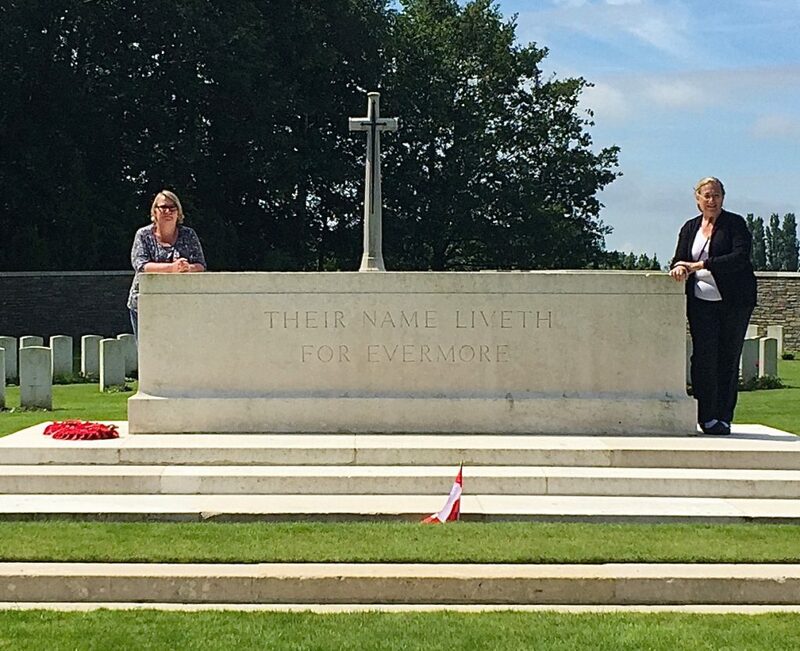 Thanks for the excellent tour around the Ypres Salient area. We all enjoyed it and found it a great insight into what went on in that part of the Great War. Also personal thanks from me for finding out so much about my grandfather. To the Canadian & Newfoundland action spots..
Jonathan combines great depth of knowledge with enthusiasm and an ability to communicate. We drove from London with Jonathan, his research on a relative already done, found the gravesite, and pieced together the brave Nova Scotian’s fate, adjusting some family myths. Jonathan tailored our tour to the Canadian and Newfoundland aspects he knew most interested us, including the major Newfoundland, Canadian, and British monuments and the less accessible sites where the Land Rover proved its worth. 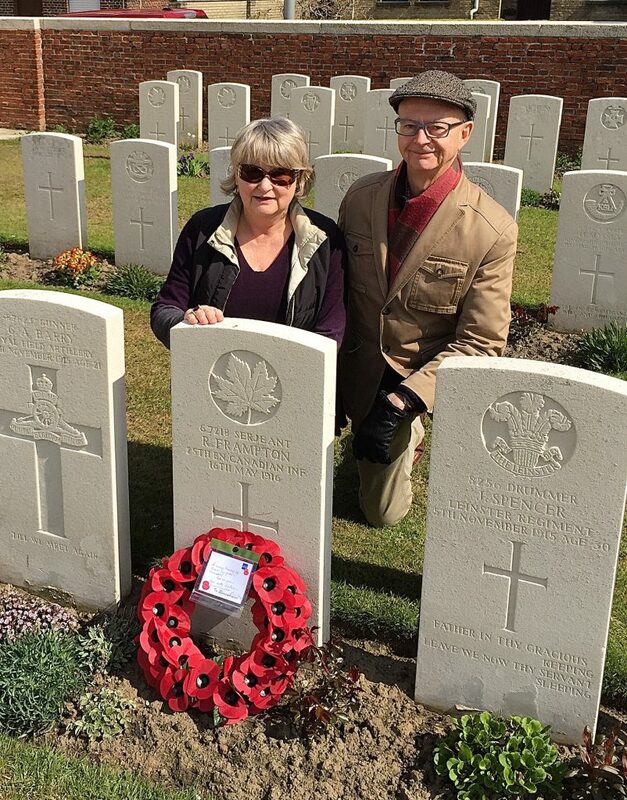 A memorable touch was a dram of single malt at a remote cemetery, raised in respect for the valiance and sacrifice of the Newfoundlanders and Canadians who rest there. 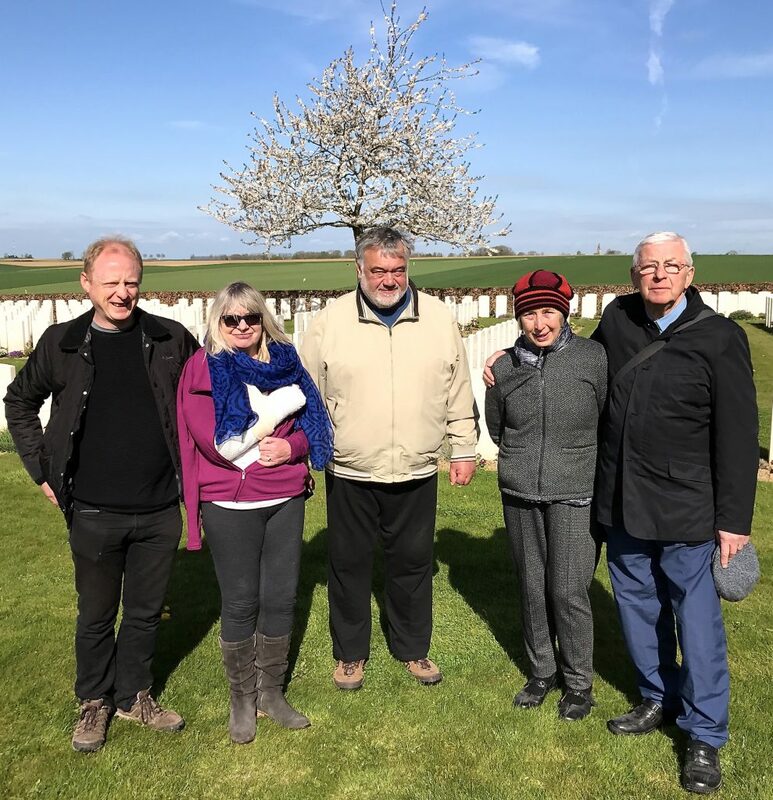 He made sure that we saw the not-to-be-missed spots like the Last Post ceremony at Ypres, the site of the 1914 Christmas truce, the place where McCrae penned “In Flanders Fields”, and the amazing Wellington tunnels. All of the above was peppered with historical fact and enjoyed with humour and respect. Lois and I unreservedly recommend this marvellous guide. 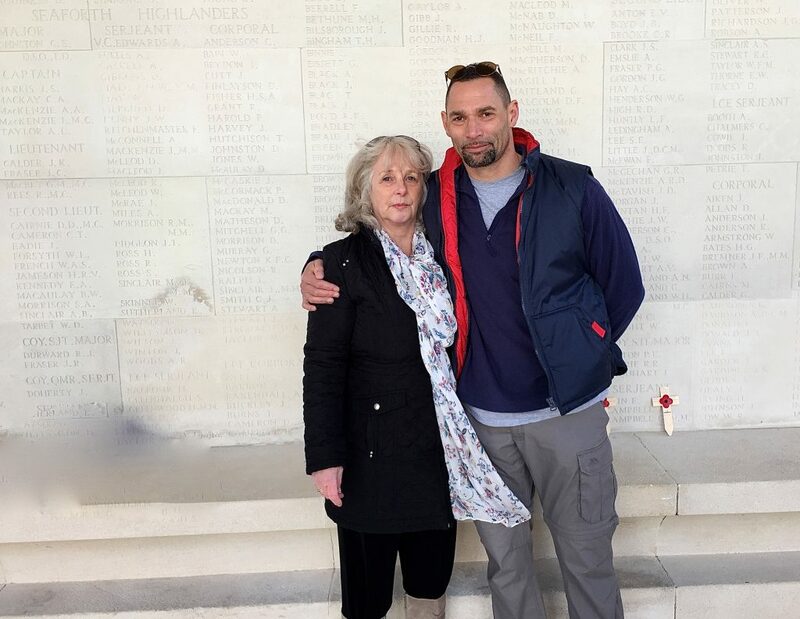 Just a short note to say a very sincere thank-you on behalf of the whole Whatmore family for your wonderfully erudite and interesting tour of the Arras battlefield and for your support in helping us to connect to the real story of my Great-Uncle Matthew. 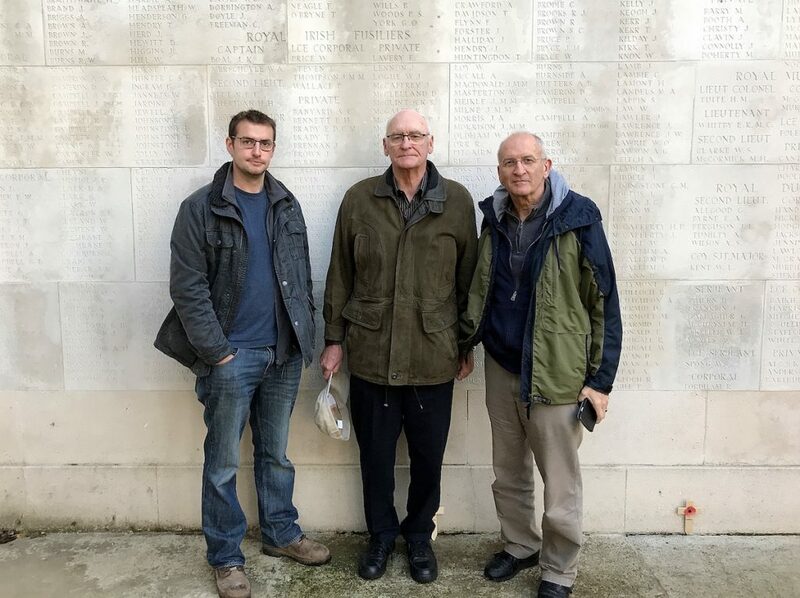 I have spent half of my life working as an academic in the university sector both in the UK and Ireland, and very rarely have I come across a professional academic with the depth of command of their subject as you have over the history of the Arras battlefield. Your stories of the people who fought and died on it really brought it to life for us. How can I thank you enough for your time and knowledge? It was brilliant, I could feel your love for Arras and all the fallen, that is how you remember so much and in detail. Many many thanks for all the stories happy and sad ,and being so attentive to our needs. You have opened my eyes to so much, Uncle Charlie and his pals can rest in peace they are not forgotten. 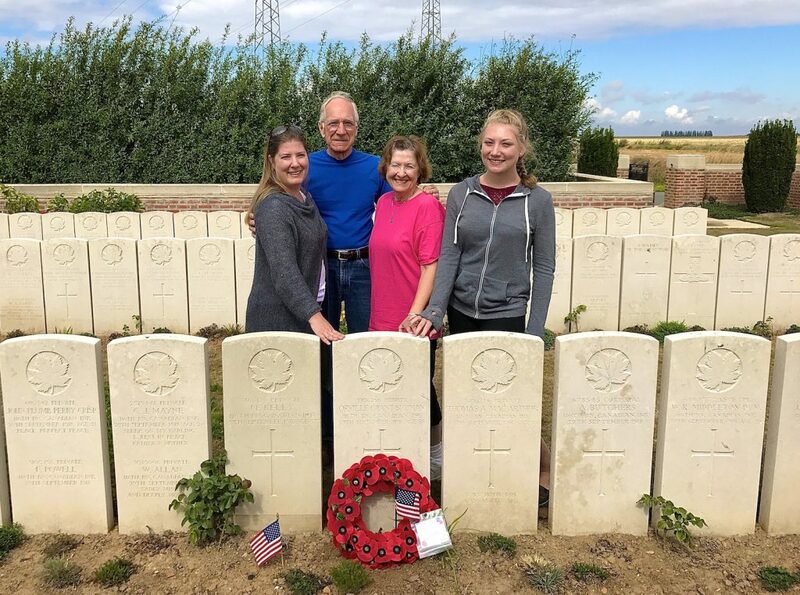 “Not knowing anything about tours of the battlefields of the Western Front and wanting to find a guide, we did what most people do, so Googled. There were a number to choose from, but we liked the look of Jon Nicholls……boy were we fortunate, we struck gold! Jon was a fantastic guide. Not only did he have an encyclopaedic knowledge of military history, he was also able to mix a great sense of humour with some very touching moments. We all very much enjoyed Jon’s company. After our two days together, which were altogether too brief, we felt we had made a lifelong friend. 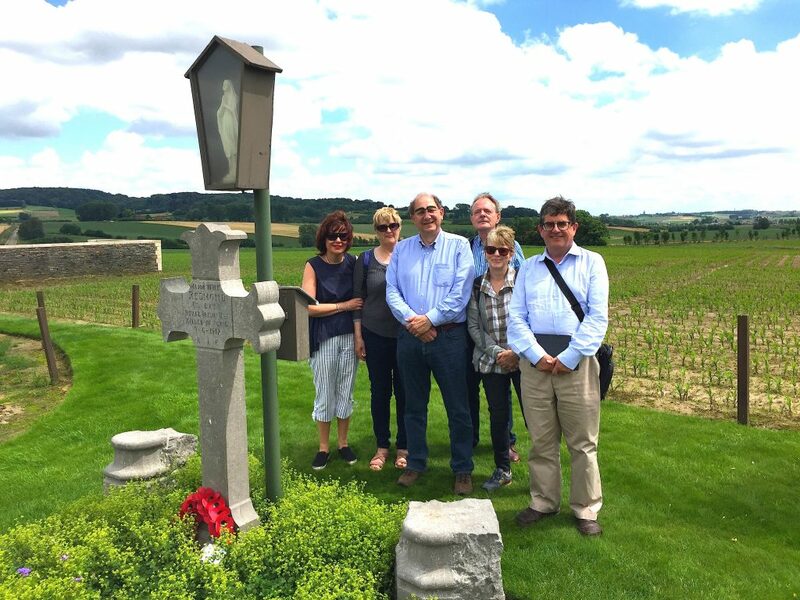 We would unconditionally recommend Jon to any intending Western Front battlefield tourist”.